I had know idea how much of a foodie area Door County was. While there, we had our fill of fried cheese curds, goat milk gelato, Swedish pancakes, wood fire oven pizzas, experience an old school Wisconsin supper club, hit up a few cherry markets and of course, go cherry picking! So with some pitted cherries ready to go, I made a cherry pie filling, some pie dough and made some pie. I didn't bake it right away and instead, I wrapped the prepared pie in plastic wrap and with foil. This helped the pie crust firm up with the little bits of butter in the dough and helped keep the filling from getting too runny or loose. 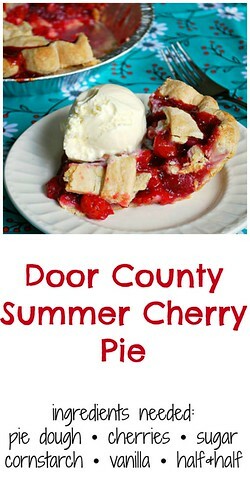 You will have a better result making this with sour cherries that need the amount of sugar called for in the recipe. Other eating cherries (like Bing or sweet cherries) don't do as well and I've found turn out mushy with a dark color. You'll notice my pie has a bright red color, which is all natural from the sour cherries. If you don't have fresh sour cherries, look for frozen or jarred ones (also known as Morello or Montmorency Cherries.) Do note - this pie is best made a couple days before you actually want to serve it. You'll need some time for it to freeze up (overnight is best)... and you'll need a day for the pie to rest after baking so that filling thickens up and cuts easier and cleaner. Besides, this is one dessert that is really better the next day anyway! Prep a 9" pie pan by rolling the bottom pie crust onto the bottom of the pie pan. Combine the cherries, cornstarch, 1 1/2 cups sugar, cornstarch, vanilla and salt in a large bowl. Set aside for 10 minutes to thicken. After the mixture has rested, with a slotted spoon, add the cherry mixture onto the bottom crust in the pie pan, leaving the juice in the bowl. Once the cherry mixture is in the pie pan, spoon over about 3/4 of the juice over the cherries. Discard the remaining juice (using it all can make the crust too soggy). Trim the edges as needed - however I like to make a thick edge to help keep the filling in. Crimp edges as desired. Brush the lattice and crust edges with heavy cream then sprinkle with remaining sugar. Carefully wrap pie in plastic wrap and then with foil. Place in freezer for at least 2 hours or overnight (preferred). Preheat oven for 400 degrees. Line a baking sheet with parchment and place pie on baking sheet. Bake in the preheated oven for 15 minutes; reduce temperature 350 degrees and bake for 1 hour or until the juices bubble up and the crust has browned lightly. To prevent the edges from browning too much while the middle of the pie bakes, cover pie with a sheet of foil that has a center hole big enough to expose the middle of the pie. I found this to be much easier than trying to play with pieces of foil wrapped around the edges of the pie - which tend to fall off anyway. Remove pie from oven and allow the pie to cool completely. Serve the next day, slightly warmed in a toaster oven or microwave and served with a large scoop of vanilla ice cream. 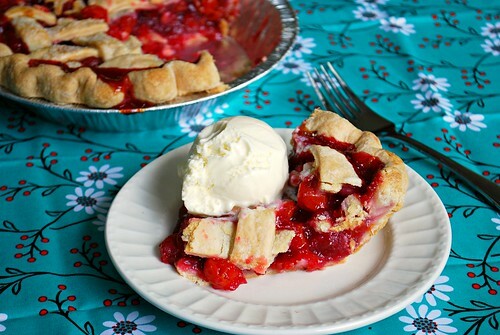 Oh my, this cherry pie looks amazing! Gimmie a slice!